Deer Meadow Inn B&B Our records show that this inn is closed. South Hollow Farm Our records show that this inn is closed. Warren bed and breakfast travel guide for romantic, historic and adventure b&b's. 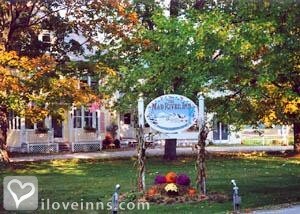 Browse through the iLoveInns.com database of Warren, Vermont bed and breakfasts and country inns to find detailed listings that include room rates, special deals and area activities. You can click on the 'check rates and availability' button to contact the innkeeper. Warren, Vermont is best known for the Sugarbush Ski and Golf Resort, with some of the best downhill skiing in the north east as well as a Robert Trent Jones Sr. designed golf course. The Long Trail offers excellent hiking, and the Mad River provides numerous water activities in the warmer months. The Warren-Sugarbush airport is one of the best places in the US to try soaring above the hills in a glider, guided by an expert pilot. By West Hill House B&B. Warren, Vermont offers a picture perfect village center anchored by the award winning Warren Store and there's a covered bridge, white church spire, babbling brook, art gallery and artisan shop. Golfers will enjoy the Robert Trent Jones Sr. Sugarbush golf course with its unmatched views of the Green Mountains. For winter sports the Sugarbush ski area is one of the top rated in the Northeast with 100 trails, 16 lifts -- including 4 high speed quads -- and inspiring vistas from the ridge line. Cross-Country skiers enjoy 80 km of groomed trails at two ski areas. Evenings offer superb dining in unique restaurants including The Common Man, Chez Henri and Tracks -- the bistro wine bar at The Pitcher Inn in the village center. Comfortable B&Bs and country inns offer matchless hospitality. By West Hill House B&B. The lovely Town of Warren, VT is a must see. The Warren Store, which is an authentic general store, has been a destination spot for travelers for many years along with taking a ride over one of Warren, Vermont's charming covered bridges,also located in Warren! Warren bed and breakfasts are the best way to settle in to enjoy a real Vermont vacation. By Beaver Pond Farm Bed & Breakfast.